US Assistant Secretary of State for South Asian Affairs Christina Rocca has expressed the hope that political parties in Bangladesh will put an end to violence and they will actively take part in parliamentary process to accelerate democratic governance in the country. Hartal and political violence only hurt the Bangladeshs people, and I think that working together in parliament is a better way to get democracy functioning, she said while addressing a crowded press conference at the American Centre in Dhaka yesterday. US Ambassador to Bangladesh Harry K Thomas, Jr and Director of the American Centre in Dhaka Karl Fritz were present, among others, at the press conference. Rocca, who arrived in Dhaka on Tuesday on a three-day visit to Bangladesh, said she had had fruitful discussions with the government ministers, representatives of political opposition, and members of the public. 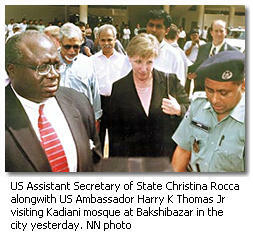 We have been working with Bangladesh since 9/11, and we found Bangladesh as an important ally in the war on terrorism. Bangladesh has provided a lot of help to the US in that war on terrorism. In this regard, Rocca also said the United States is fighting the war on terrorism every day on many fronts. Were going after terrorists and their safe havens to break down their ability to communicate and their sources of funding, she said. Referring to her meeting with the representatives of Ahmadiyya community in Dhaka yesterday, she expressed the hope that the Bangladesh government, in keeping with the Constitution and law, would continue to strive for ensuring equal treatment and security of the Ahmadiyya community irrespective of their religious affiliation. There is a lot of concerns in the US regarding the treatment the Ahmadiyya community receiving in Bangladesh. The problems facing by the Ahmadiyya community caused us concerned. I told the Bangladesh government that the world is worried about it. And, I think Bangladesh is a moderate and tolerant society, and Bangladeshs people will continue to show tolerance, she said. Mentioning the issue of corruption in Bangladesh, Rocca said the US is concerned about the impact of corruption in the country. We hope that the Anti-Corruption Commission will be seen as a priority and established as soon as possible. It is critical for more foreign investment in this country, she said. Rocca said Bangladesh, having a large population, is facing certain economic problems, and one of the ways out of the problems is more foreign direct investment (FDI). Regarding her meeting with Leader of the Opposition in Parliament and Awami League President Sheikh Hasina, the US Assistant Secretary of State said she had made a very strong argument for the need to go to parliament when she met with her. I certainly hope that they (opposition) will be able to go to parliament, she said.